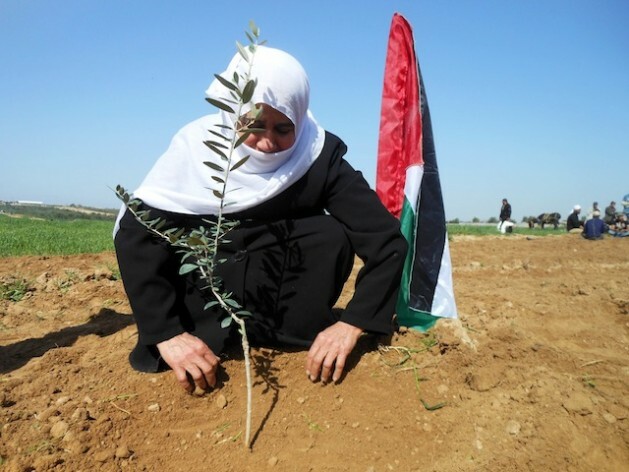 Um Abed plants an olive tree in support of Palestinian farmers. Credit: Eva Bartlett/IPS. ZEITOUN, Gaza, Feb 10 2013 (IPS) - Tawfiq Mandil, 45, stands amongst hundreds of Palestinian farmers, activists, and international supporters in the Gaza Strip’s eastern Zeitoun district, about half a kilometre from the border with Israel. They are renewing a call for the boycott of Israeli goods. With an Israeli surveillance blimp hovering above and within sight of a remotely-controlled machine gun tower, the significance of the rally’s location near the ‘buffer zone’ was not lost. Israeli authorities prohibit Palestinians from accessing the 300 metres flanking the Gaza-Israel border. In reality, the Israeli army regularly attacks Palestinians up to two kilometres from the border in some areas, rendering more than 35 percent of Gaza’s farmland off-limits. Great article (I was referred to it by LUV News)! Go Palestine! !